Time after time, when I talk to aspiring young writers – or even aspiring not-so-young writers, I hear their frustrations about how they have good ideas but the stories just don’t turn out well when they put the words on paper. It’s possible that they’re not good writers. But it’s more probable that they simply stopped too soon. I certainly had that problem when I was a kid. I loved writing stories and I had tons of ideas. But I had trouble finishing my stories. Usually, I just abandoned a story and started a new one. That’s why I was happy to find a childhood story that I actually finished. It’s not a good story but I’m extremely pleased with it because it has a great structure. After all my failed attempts, I was unlocking at least one of the “secrets” of writing. A story needs a beginning, a middle and and end. Also, unlike some of my great failures based on subjects I knew nothing about (the Southern plantation girl, the Hawaiian girl) the story that worked was simple, age appropriate and relatable. I think a lot of writers who give up in frustration have forgotten the most important thing about writing: revision. Getting the first draft down on paper is the hard, sweaty labor. But then you have something to work with – something you can hone and craft and play with and make better and better with each draft. That’s the stage I’m currently in. I just completed a manuscript and I’m guessing I did about 20 revisions – which isn’t a lot for me. That doesn’t count the mid-writing revisions. For instance, I was well into the revisions when I realized that I needed to add a lot of detail to create a complete, believable and appealing world. So I stopped there and revised what I’d already written, building in that world before continuing. As usual, when I reached the end, things had changed along the way and I had to do several revisions to focus the story more sharply toward that ending. And then, I had to take out some of the detail I had added and make some changes in the lead character. Now I find I need to dive in again and re-define two of the characters. 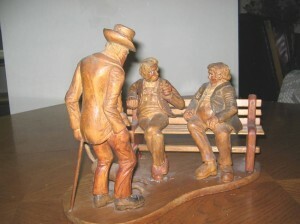 I thought about revisions when I pulled out some of my father’s carvings. 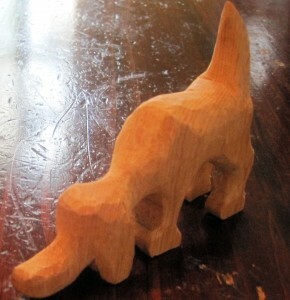 My dad was a great amateur artist and he did a lot of wonderful, whimsical wood carvings. Late in life, he had eye problems and although he didn’t abandon art, he put down his carving knife. After he died, I found some unfinished carvings and as soon as I looked at them, they reminded me of a writer’s rough drafts. The shape is there but the sharp cuts aren’t. The little details aren’t there either and none of the color. And yet, in each one, I can already see the personality emerging! 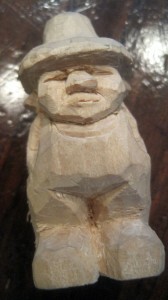 Dad always put a lot of character – and movement – into his carvings. This dog is just a beginning – the shape is very rough. But already I know that he’s an inquisitive hound. This gnome-like creature looks like a cranky Hobbit to me. He’s definitely not a happy one. This lady skater didn’t fare well in my suitcase. 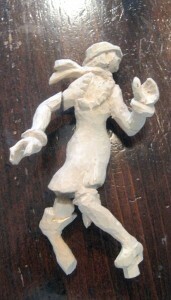 She’s rough as well – no defined skates yet, the hands are very rough. Still, I see the breeze picking up the ends of her scarf and the way he was going to catch her in an off-balance pose. Dad did a lot of skaters and they always could stand on their tiny carved skates, except for the one on his rear end. This entry was posted in Friends and Family, Writing. You can leave a response. Follow any responses to this entry through the RSS 2.0 feed.